However, we all know that image quality is not the only thing to consider in video production. Sound is equally important. Up until recently when watching a 360 video you tended to get a static stereo sound image that pretty much stayed the same as you moved around the 360 sphere. Wouldn’t it be nice if, like in the real world, as you moved around, the sound moved too? Well the technology is out there. In fact it has been for many years. It’s called Ambisonic sound. Up until now though there wasn’t really much use for it, but now with the advent of VR video, we have the perfect platform on which to layer this technology. Now we need to record this strange format. What do we need? I’m not going into detail on this article on how Ambisonic works, Google is your friend here, but I am going to look at a new microphone from Sennheiser, solely designed for capturing high quality Ambisonic sound. The Mic in question is the Sennheiser Ambeo VR Microphone. Here I am going to give you an introduction to the mic and what comes with it. Also what else you will need to get recording Ambisonic sound. In another article we will look a bit more in depth at the process in recording and mixing Ambisonic with your VR footage. The mic itself looks much like a typical Sennheiser mic, all be it a bit bigger. It’s not until you remove the larger head basket on the top that you realise this is no ordinary microphone. In fact it’s really 4 microphones in one. 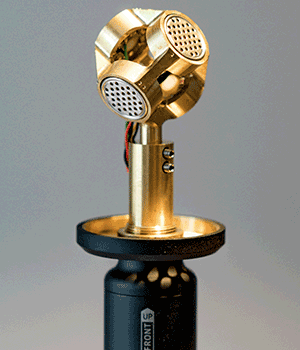 Under the basket is an array of 4 cardioid condenser mic capsules all in a 45 degree off axis pattern. At the bottom of the mic, instead of your typical 3 pin xlr connector is a 12 pin Din connector, allowing you to plug in the short break cable that provides you with 4 three pin xlr connectors. Also provided is a small Rycote suspension mount and foam windscreen. The Ambeo VR mic, is very sensitive to wind noise. Inside this is not a problem, the foam is adequate, however outside, which is where I suspect this mic would be used a lot you need extra protection. Sennheiser recommends the Rycote 25mm Baby ball basket and wind jammer. This fits perfectly, and on the testing I have done so far works amazingly well at taming the wind noise. A 5ft 12 pin Din extension cable is provided to allow some distance between the mic and your recorder, however I still find that a bit short. Pinknoise can supply either a 5m or 10m Extension cable, which I highly recommend. Now to recording. You are provided with 4 outputs all requiring 48v phantom power, from this Mic. Each output is numbered which is important as when recording with this mic, you must get the channels in the right order. It’s also important that each mic output is recorded with equal gain across the 4, otherwise the imaging will be off. In the field I am using the Zoom f8 recorder, which has the ability to record to the correct Ambeo format and allow 1 single gain knob to control the gain on all four inputs. This makes life much easier. I also understand that Tascam DR-701D now also records Ambisonic sound. Once recorded you can use the excellent free Sennheiser Software to tweek the audio, adjust the sound field to line up with the video and convert to the correct Ambisonic format for use with your VR video. Sound quality from this mic is excellent. With a low noise floor, excellent sensitivity and perfectly matched capsules. Build quality too is great, although I would be careful with the xlr breakout cable as the four cables are quite thin, and it’s not something you can pop to a store and replace easily. In my next article I will go into more detail on how we use this mic. The use of the Sennheiser ambio software and linking the audio with a VR video file ready to upload.